The Asking Formula is a 6-step, simple, and repeatable process that accomplishes 1 thing: it teaches you how to more effectively ask for what you want. John delivers “The Asking Formula through a program that is meaningful for your business or audience. Click (or hover over) a thumbnail to learn more about each program. A highly motivational and engaging overview of The Asking Formula that provides story-based and humorous examples of program fundamentals. Participation is encouraged by sharing personal experiences. Utilizes innovative exercises and unique audience break-out sessions to drive deep into The Asking Formula fundamentals and ensure learning is taking place. An interactive session that builds on the work in the 1/2 day workshop. The additional time allows for more advanced exercises and deeper utilization of the methodology. Bring The Asking Formula to your clients, sales team, leaders, and employees through a full immersion certification program. 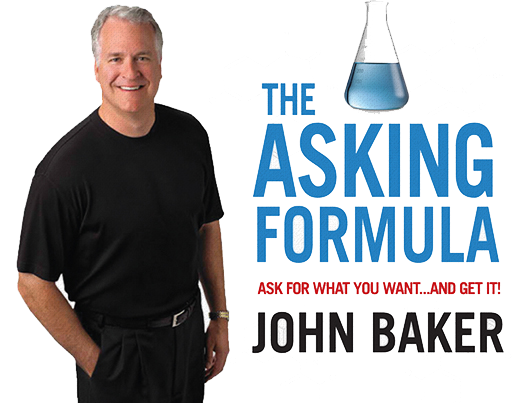 Interested in reading the 1st chapter of “The Asking Formula” to understand more? Click HERE here to receive it in just a few moments. Click the video link below to watch a segment of John’s keynote speech. If you’d like to watch individual clips from this reel, please visit this playlist on our YouTube Channel.